I knew it and I felt as a cat person that I am going to get some cat-related gifts for Christmas! And I got it! A wonderful lady and a friend of our family Mildred gave it to me. Thank you so much Mildred! 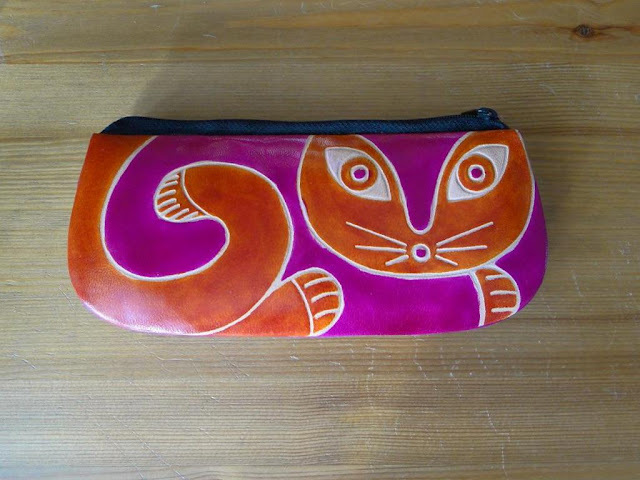 This is a really nice piece of art, this colorful leather case with an image of exotic kitty on it – crafted in India and sold in one of my favorite stores, Ten Thousand Villages Canada. The case is very multifunctional – can be used for carrying pens and pencils, also, as a coin purse or as a case for glasses. Amazing, isn't? Actually, this is a mail holder, but can be also used as a napkin holder. And how was your Christmas, cat lovers? Did you get something with kitty on it, like me? Feel free to tell your stories here, in comments section to this post, or at Murchyks Facebook page. Thank you!